Our moisturizer is a cream suitable for most skin types. It has been crafted with hydrating oils and butters to aid moisture replenishment and soften the skin. Shea butter is rich in skin conditioning emollients. Cupuaçu is a superfruit similar to cocoa ... its butter softens the skin but is less greasy than cocoa butter. Often found in expensive creams and lotions, avocado oil is rich in moisture but light weight and absorbs into the skin quickly. Cherry Kernel oil is a light oil full of antioxidants, vitamins A and E, and eleostearic, a CLA (conjugated linolenic acid) that helps protect the skin from UV light. A tea made with Lavender, Calendula, Fever Few, Blackberry Leaf, and Peppermint Leaf is added to the oils and butters to sooth and refresh the skin. We also add a yeast derived collagen (pseudocollagen) along with wheat germ and carrot seed oils to nourish the skin, and borage seed oil to help the skin retain moisture. A cosmetic mica is used as a colorant and a cosmetic preservative is used to inhibit bacterial growth. 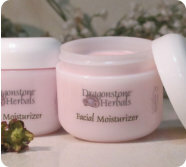 Our moisturizer is available in 2 ounce plastic jars. Warnings/Precautions: For external use only, do not ingest. Do not use if allergic to any of the ingredients. Discontinue use if irritation or redness occurs.